Reappointed this year for another three-year term, Carter started with MATA in 1991. Since then, she has concentrated on funding since the agency has no dedicated source. Without hesitation, Mattie P. Carter took a chance to learn more about her hometown's public transit system when the Memphis mayor offered her a position on the city's transportation board. She found a passion at Memphis Area Transit Authority (MATA) that would eventually lead her to national board seats at the American Public Transportation Association (APTA). "The best thing I have is common sense," says Carter, who taught math and theater when she was first appointed to MATA. "If you have a little bit of it, you're a little ahead of the game." Carter's desire to learn has been apparent since she was named salutatorian of her high school and offered a voice scholarship at Tennessee State University. She majored in mathematics and taught high school for 32 years. Upon stepping down, MATA became her focus. Reappointed this year for another three-year term, Carter started with MATA in 1991. Since that time she has concentrated on funding since the agency has no dedicated source, which complicates the annual budget process. "It's hard to make plans because the odds of new funding are slim," she says. "If you don't get any new money, with prices rising on everything, it's hard to keep that budget balanced." While Carter says the fight for funding hasn't made much progress, she is hopeful that people's understanding of the importance of mass transit is catching up to reality. "At a time when we need service the most, we have to stop services, and lay off and furlough people when we need to rev up our services," she says. Carter's immediate plan for MATA is to stop using other similarly sized agencies as a guide for the board. She says it needs to first look at successful transit authorities, big and small, and then replicate their victories in a way that fits Memphis. "There are a myriad of agencies that aren't getting phased by this funding problem," she says. "Those people who have sound systems that are running well, we can benefit from them." 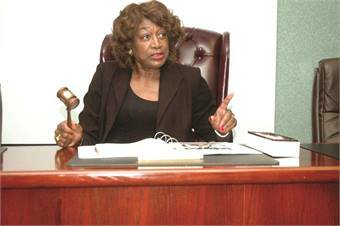 As Carter finishes up her more active roles with APTA, where she has held various board positions since 2001, her time will primarily shift to Memphis and her passion project: volunteering for the National Association for the Advancement of Colored People's Academic, Cultural, Technological and Scientific Olympics. But this transition is only made possible after 10 years at APTA, where she started as secretary for the transit board, which quickly evolved into vice chair and then chair. In 2004, Carter moved to the executive committee at APTA, where she also took roles as vice chair and then chair in 2009-2010. Her position as immediate-past chair ends this October, though, she recently participated in hiring APTA's new CEO. While leading as chair, Carter helped to implement a new governance model for APTA members. "We're about to see more people come into a leadership role with APTA who would otherwise not get that opportunity under the former structure we had," she says. Previously, there were specific routes to participating in leadership roles depending on the type of membership, and though there are still criteria and larger categories that classify the types of members, these routes have been eased. In turning a great deal of her transit focus to Memphis, Carter is optimistic about MATA's future. She is hopeful about plans to push the light rail trolley system forward. The project, which would connect downtown to Memphis International Airport, has been stalled due to lack of funding. "We don't mean to cancel the project," Carter says. "It's just on the sidelines until we can find funds."